Backing Up is Essential - Set it and Forget it! Have you ever lost irreplaceable memories when your computer crashed? Lost important documents due to a virus? This just recently happened to my sister and also happened to me a few years ago. Our computer crashed and we had all of our photos and videos on it. Guess what... I had no backup of the hard drive and we were able to recover the photos but we lost all the videos of my son from birth to age one-and-a-half (among other things). It was so heartbreaking! That is what finally convinced me that it was worth the time, effort, and research to get a system in place to back up our important files. After all the researching, I chose to use iDrive, and it is so easy! We have been using it for over three years. I have it set to automatically back up both computers nightly, and I never have to worry about it at all. 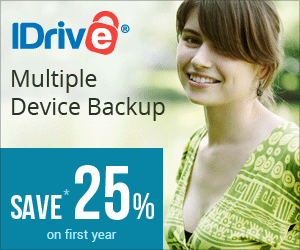 I have also recovered documents and files from our iDrive cloud storage so I know it works! With several plans to choose from, including a free version and affordable options with larger storage, there is little financial risk to getting started. You can choose which files and drives are backed up (let's say you only want your Photos and Documents folders to be included), so the free version might work or there are great options for both Personal and Business with multiple devices and unlimited users/devices. ​As a bookkeeper, I have experienced watching my clients lose essential documents and data, and Quickbooks files saved to their hard drive when they did not have a backup. I have been hired to rebuild someone's data from scratch, which takes many, many hours at a substantial cost and have heard about similar stories. I would be heartbroken for anyone who lost their precious digital memories like we did. Take the time to find a system that works for you and get a cloud back up in place today. I don't think you will ever regret it! Thanks for reading and please let me know if you try iDrive in the comments!